On Saturday night, Waterford Crystal – the magnificent company that created the crystal on the official Times Square New Years Eve ball – rang in 2017 with a host of celebrities and incredible talents from around the world. You may have caught some of the action on television, but we have four exclusive photos from the event to share, courtesy of Waterford Crystal. 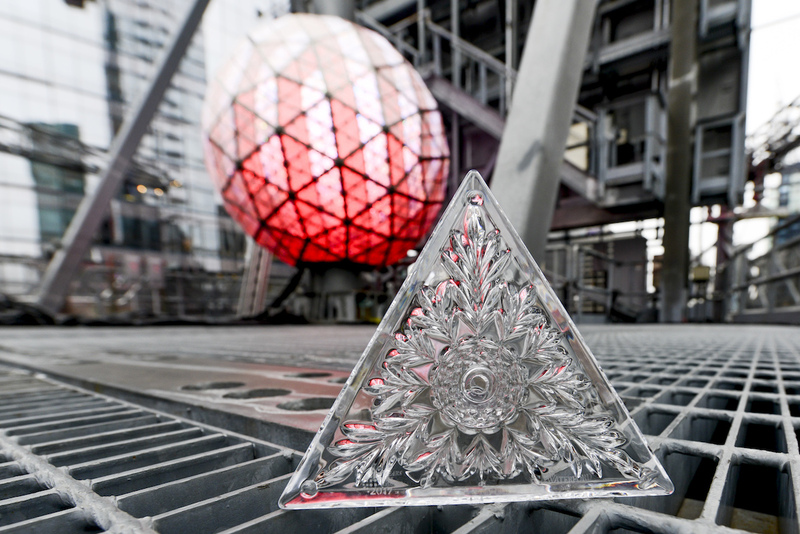 In 2017, 288 of the Waterford Crystal triangles introduce a new pattern, “Gift of Kindness.” Acts of kindness are gifts that enrich our souls, promote understanding and strengthen the bonds of humanity. The helping hand conveys our innate spirit of charity and compassion. The “Gift of Kindness” pattern is composed of a band of touching rosettes supported on a base of thumbprint olives and rich diamond cutting. The band of touching rosettes that make up the “Gift of Kindness” pattern can be found in Waterford’s 2017 Holiday Collection, featuring a crystal ball ornament, disk ornament, flute pairs (clear and ruby cased), blown glass masterpiece and replica ball ornaments and snow globe.